When describing the species in 2002 Kullander and Britz noted that this species had only been recorded from two areas within the upper Ayeyarwady River basin in northern Myanmar. One was a series of streams running close to the city of Myitkyina in Kachin state and the other an unspecified locality in the lower Shweli River, a tributary which converges with the Ayeyarwady a couple of hundred kilometres south of Myitkyina. As far as we know no new populations have been discovered since. The type locality is a shallow (~ 1m depth during the dry season), clear water stream with a sand and pebble substrate which flows through both secondary forest and agricultural land. The water is described as having a “moderate” current with grassy marginal vegetation and a Cryptocoryne sp. growing submerse. Here B. corycaeus occurs sympatrically with B. kyar and Dario hysginon with the three occupying different ecological niches; B. corycaeus is found in running water towards the margins of the stream, B. kyar in the faster flow towards the centre and D. hysginon only in still pools around the shoreline. A whole host of other interesting fish were found at this location from Acanthocobitis, Schistura, and Danio to Pillaia, Indostomus and Microphis species. 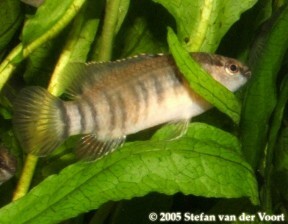 Around 50 – 60 mm for males, with females a little smaller. A single pair or small group can be housed in a tank with a base measuring 60 ∗ 30 cm or more. B. kyar will thrive in a well-structured set-up with a sand or gravel substrate plus plenty of water-worn rocks and pebbles to provide cover. Plant species that can be grown attached to the decor such as Microsorum, Taxiphyllum or Anubias species can be added if you wish but aren’t essential. Driftwood twigs, branches, floating plants and leaf litter can also be used to lend a more natural feel while lighting need not be too strong. Flow rate should be somewhat higher than for most other Badis species with some visible current. Some cave-like structures should be included to act as potential spawning sites; many breeders use half-coconut shells or up-turned clay plant pots with drilled holes or parts of the rim removed to allow the fish access. Temperature: This species is subject to seasonal temperature fluctuations in nature and is comfortable between 15 – 25 °C with even greater extremes being tolerated for short periods. In many countries/well-insulated homes it can be therefore maintained without artificial heating year-round. Temperatures towards the upper end of this range are known to stimulate spawning activity meaning a heater will be required if you want to breed the fish outside of spring and summer months though. Set it to around 68 – 75?°F/20 – 24?°C for long-term care and breeding. pH: Prefers neutral to alkaline water with a value between 7.0 – 9.0. Hardness: The water in northern Myanmar is typically soft despite the relatively high pH so aim for somewhere within the range 18 – 90 ppm. Badis species are micropredators feeding on small aquatic crustaceans, worms, insect larvae and other zooplankton. They can be a little picky in the aquarium and may not accept dried foods although in some cases they will learn to take them over time. At any rate they should always be offered regular meals of small live or frozen fare such as Artemia, Daphnia or bloodworm in order to develop ideal colour and conditioning. If you do intend to house it in a community tankmates must be chosen with care. It is slow-moving with a retiring nature and may be intimidated or outcompeted for food by larger/more boisterous tankmates. Peaceful cyprinids such as Trigonostigma or Rasbora species are likely to make good choices as are gouramis and other surface-dwelling species. Accommodating it in a biotope-style community of Myanmarese fishes is more tricky although suitable species from the Ayeyarwady basin include Danio choprae, D. albolineatus, Pethia stoliczkana, and Colisa lalia. Certainly do not combine it with similar-looking, territorial bottom dwellers such as dwarf cichlids unless the tank is very large and never house it with other Badis species as hybridisation might occur. Also note that freshwater shrimp of the popular genera Caridina and Neocaridina, and certainly their young, may be preyed upon. Females are smaller, have duller patterning and a noticeably shorter, rounder-looking body profile then males. Males also tend to develop slightly elongated fins as they mature. Badis are cave spawners that form temporary pair bonds and are not usually too difficult to breed provided the tank is arranged correctly (see ‘tank set-up’). Other species are best omitted if you want to raise good numbers of fry although in a mature, well-furnished community a few may survive to adulthood. Either a single pair or a group of adults can be used but if using multiple males be sure to provide each with a cave to defend. Water parameters should be within the values suggested above. Feed the fish with plenty of live and frozen foods and spawning should not present too many problems. Like most badids B. kyar is poorly documented in aquarium literature and has yet to find significant popularity in the hobby, though given its restricted natural distribution it is unlikely ever to be available in large numbers. The fish in our image is a specimen included in the only batch of this species known to have been exported to date. This species has a very slender body shape (which may be an adaptation to its habitat) and in this respect is similar to B. pyema. However B. kyar possesses relatively solid dark, uniform vertical bars on the flanks whereas in B. pyema the ‘bars’ are formed by rows of irregularly-arranged dark spots as in most other Badis species. If further confirmation is required examine the markings on the caudal peduncle of the fish as B. pyema exhibits a dark blotch on each side which is replaced by a solid bar in B. kyar. There are two unique species which don’t fit into any of these groups; B. kyar is separated by its relatively elongated body shape, pattern of vertical barring and band-like caudal fin marking; B. juergenschmidti is similar to B. kyar in some respects but the first vertical body bar is straight (vs. curved), vertical bars 5, 6 and 7 are solid (vs. vertically split) and the dorsal and lower caudal fin lobe are edged in white in males (vs. no white patterning). In the phylogenetic study B. kyar was found to represent the sister group to either the B. ruber or B. badis/B. assamensis clades depending on the test performed and further studies are required to determine the exact placement of these two within the genus.